(Newser) – Former President George W. Bush is giving even odds about whether another Bush will try to occupy the White House. 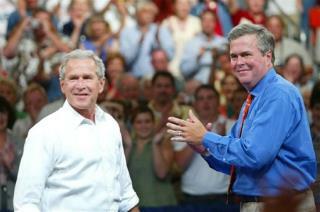 Brother Jeb, a former Florida governor, is "wrestling with the decision" of running for the Republican nomination in 2016, George W. Bush says. "I think it's 50-50," the former president told CBS' Face the Nation. "He and I are very close. On the other hand, he's not here knocking on my door, you know, agonizing about the decision. He knows exactly, you know, the ramifications on family, for example. He's seen his dad and his brother go through the presidency. I'd give it a tossup." The former president was more conservative in his estimate than another family member. Jeb Bush's son George P. Bush said two weeks ago it was more likely than not that the former Florida governor would move forward. As Governor of FLORIDA; JEB Bush wore a Confederate Flag lapel pin! Any reservations about that? Noel Bush was the bank of SILVERADO! Didn't his bank go bankrupt? Should Americans feel safe about ANOTHER bank president? Good grief....if it's Bush vs. Clinton I'm just leaving. This all part of the long term plan of the Bush clan. G.H.W. Bush is from CT. He had his sons move to the most populous states like TX and FL so they could become governors with a large voting base. He had Jeb marry a Mexican woman to get the Spanish speaking vote. There is no choice of candidates in America. The Powers that be appoint their own or puppets on a string like Obama. If voting changed anything, it would be illegal, Jeb Bush will win.